That’s right! Kinek is giving away a nice treat just in time for the holidays. All you have to do for the opportunity to win is follow the instructions below. You can earn several entries by commenting on this post, tweeting about the giveaway, referring friends, and more. What do you have to lose? The $300 gift card could be landing in your wallet! 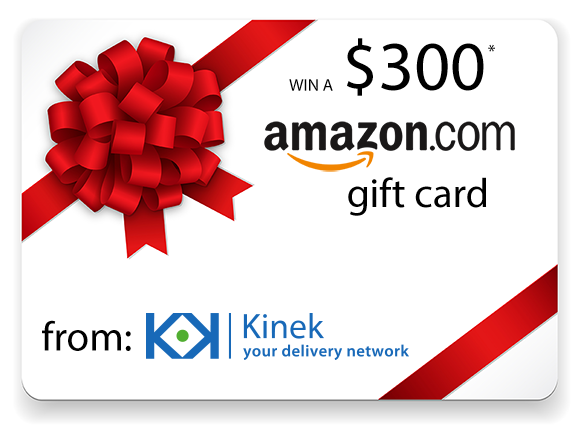 *If you are selected as the winner and have signed up for the Kinek service at www.kinek.com, the $300 gift card will be increased to $400. If you have received a package in the Kinek network before Dec 18th, 2015, your gift card will be increased to $500! this would help immensly around Christmas for gifts for the kids. Happy Holidays. Would love to win! Kinek and Amazon will make the holidays better ! I would buy a new backpacking bag for my travels! That sounds awesome! Good luck! A massage chair for back. Oh, that sounds nice! I wish I had one of those here at work! I’d treat myself to a designer handbag! Would love some new boots for winter. Maybe some new grooming supplies – new set of scissors, a blower, new blades. I would love this to finish up my holiday shopping. Greaat sweepstakes! Since i am home bound because of health I shop online for everything, especially Amazon.. Wonderful giveaway. Thank You! I would purchase gifts for my two children on Amazon…. Thanks you!! I would buy a Kindle Fire and a new digital camera and bag for it. I would like to win to be able to do some Christmas shopping. Thanks and Happy Holidays! Love this service – you guys rock, keep up the good work! I would buy myself some books, and some home necessities. That’s a lot of books! 🙂 Good luck! I would buy a new cell phone for myself. I’d probably put it towards the new washing machine my wife wants. I have a whole bunch of books on my wishlist so I’d buy those books. I would buy some classy-looking artificial greenery for my living room. That stuff is expensive! That sounds like a great mom! I would buy my kids gifts and something forthe hubby and me. I would buy a bunch of things if I win the contest – – mostly some books that are much cheaper in the USA compared to Canada. My TV is very old, “not flat screen”, I would buy a new one. I would use most of it to buy a nice gift for my best friend who does so much for me. I would use it to buy my family of 3 winter boots for our brutal winters here in Cleveland! I’d buy clothes for my 2 kids that are growing way too fast, and a little something for myself. I would buy myself some new winter boots!!! Maybe a gift for my Mom…she deserves it. Well given the exchange rate, I could afford 2 cups of coffee with the card. i would use the gift card to do something nice for myself,pamper me, such as a day at the spa. I’d use it for some Christmas gifts. I would use the card to buy much needed snow tires for my vehicle. If I won the $300 Amazon gift card I would use it to purchase some new cookware because my current cookware has just about had it, I do a lot of cooking. I would buy some new sheets and blankets.